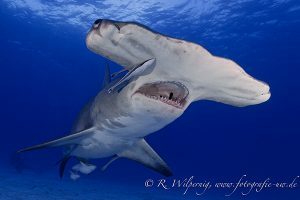 Howellsdiveshop.com in conjunction with Diversinnmx.com is offering unique opportunity for four divers to participate in the famed Hammerhead sharks in the “Sea of Cortez” in La Paz, BCS. This dive is a special offering for advanced divers . Dive the spear at 70 to 120 feet to photograph hammerhead sharks rotating in mass around the mound. Reef dive is 20-30 feet with rich corrals and many nudibranchs to photograph. Special arrangements are being made with a seasoned Captain and Dive master for this trip with shark experience. No feeding done of allowed. Cost: 3600 USD each all inclusive. Plus 16% Federal tax. Airfare is not included. Airport pick-up and delivery from La Paz or Cabo San Lucas. One half down on booking which is non-refundable. Second half is due 30 days before the trip. This is a very special opportunity being offered. If the divers do not have deep dive specialty they will at the end of this trip at no cost. This trip will book fast so call soon if interested.